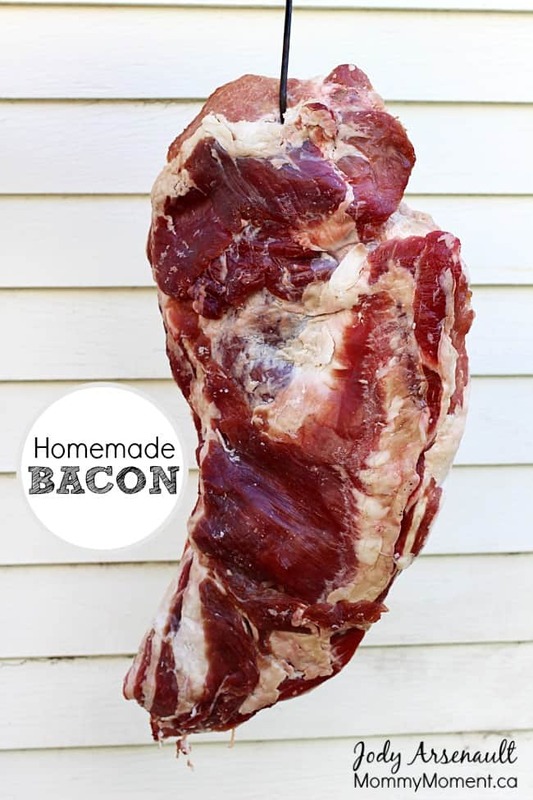 Homemade bacon – this post features a recipe, but more importantly, it is about tradition, family tradition passed down through generations. As some of you know, my wife Jody and I purchased her grandparents old home. We very much enjoyed spending time with her grandparents in their later years, listening to their stories of life. I enjoyed their recipes. My wife’s grandpa was a butcher in his former life and he loved to process his own meat. In fact even in his retirement years, he still loved working with pork, beef and wild game. He had his own equipment, the highlight of these butchering tools was his smoker. It is a simple smoker, built out of an old culvert with a door cut into the bottom and some sheet metal on the top. It is not pretty, but it works and the results are yummy. Before grandpa passed he “showed me the ropes”. I was taught to make everything from smoked fish, ham and sausage. But my favorite thing to make is….BACON. Everyone loves bacon and it is not as hard to make as you might think. 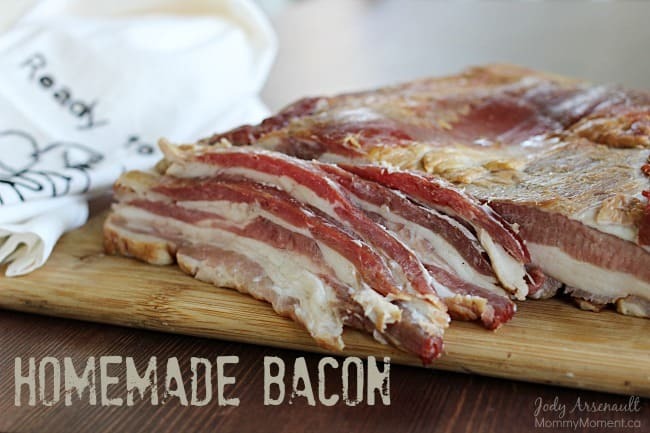 Here is the recipe for old fashioned/old school smoked bacon. First you get your belly. You can get it with or without skin. I prefer without the skin so the salt can absorb in better. Next you salt the belly with all the salt. Be liberal with your salt and ensure the belly has all been “kissed” by the salt. Now let it sit in the fridge for 2-3 days. You need time for the salt to penetrate the belly all the way through. After you feel the belly has soaked long enough you can light a fire. I have an old culvert, but there are many many many homemade designs that can be found on google that are simple and cheap to make. Now the trick is to light the fire and then “kill the fire”. You don’t want heat, but you do want smoke. I like to build the fire so it is crackling good and hot and then I place the lid on my smoker so it is starving from oxygen. As a result it will smoke. That is when you add the belly. You can lay it down on a rack or hang it with hooks. Now let it be, it should smoke for approx 2-3 hours. Check the fire every 15 min to ensure it is still going and not too hot. Are you looking for some bacon recipes? Bacon Wrapped Tater Tot Cheese Bombs, Bacon Tomato and Kale Quiche. 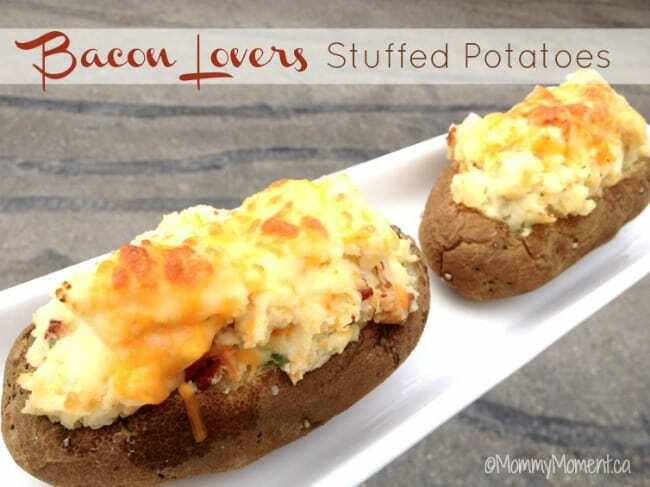 You may also like this BACON LOVERS’ STUFFED POTATO RECIPE. You can sign-up to get an email update each day. Connect with us on Pinterest and Instagram and Facebook. wow, I’d really like to try this one day. Though, I don’t trust myself with the fire, perhaps I need an actual smoker. lol My friend has one and loves it. Oh Tammi, A smoker is such an incredible thing to have – I bet you would love it! I never knew that Bacon was so relatively easy to “make.’ I think it is wonderful that so many of the old traditional ways of preserving our food are being passed down and used by families. Kudos to people who do this delicious and useful work! Thanks Sandy! We appreciate you leaving a comment. If your husband has any other questions about making this, Trevor would be more than happy to give tips etc. VERY impressive that you can make that and SO special that your skills have family history to them. I bet that bacon tastes AMAZING! Oh Amanda – it is incredible bacon! I love that we can keep the traditions alive! This is something we want to try. I really dislike buying store bought bacon because of all the chemicals added. Great post. Oh, my grandpa made amazing homemade pepperoni too – Hubby is going to be making that yet too! I need to show my husband this so he can stop asking for an egg! amazing! Love that your family makes their own bacon – the flavour would be amazing – nothing better than something fresh. This is very cool! I would love to try this. Thanks for sharing. This was interest to read, thank you! That’s pretty neat! And to be able to share your memories now with your young ones will be something you can cherish forever. Btw, the fish that Trevor is holding is HUGE!!! So lucky for both! Bacon..is there anything better? Not sure I would trust myself to do this..but I really would love to try! I wouldn’t mind trying this, but with a smoker. We had a smoker and my hubby gave it away when we moved. Now, I wish that he hadn’t! This would be awesome to make! That is awesome that you guys do this!! Maybe I can get the husband to smoke some for us! This is amazing! I would love to try this sometime. We hope to have a pig next year. This would be cool to try. This and homemade apple cider is going on my bucket list. OH My! That is impressive, making your own bacon! Good for you guys! This is soo old school and yet so cool, i’d luv to be there and see it all in progress, i can smell it from here, thanks and keep it up! Yumm! This make me miss my home in the country so much. I loved having the ability to be pretty much self sustainable and the freedom that it gives. I could still do this in the backyard if I bought a smoker but I don’t think it would taste as good as doing it with the old-fashioned type. 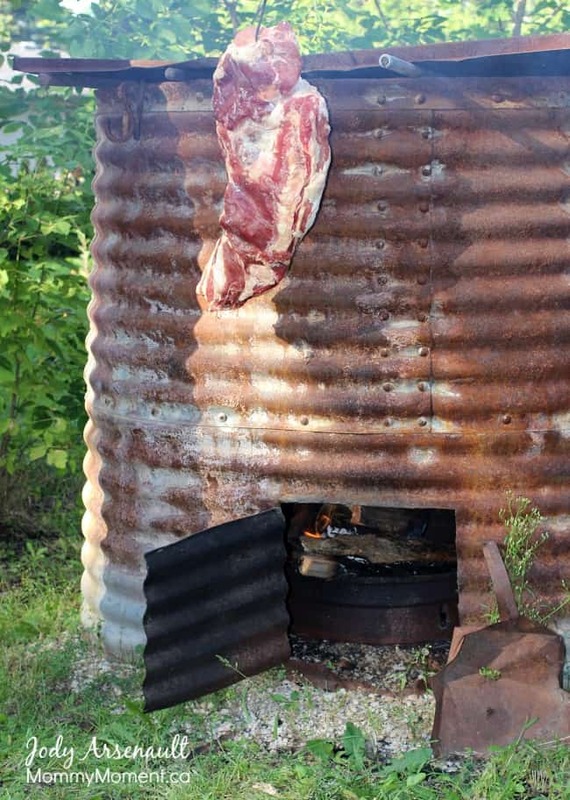 We had a smoke house at my friends farm. I miss it so much since they moved to town. I am surprised to see how easy it is!